Begin by anchoring your CLX to a CLX Door anchor above your head. 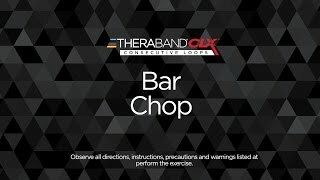 Place either end of the CLX easy grip loop onto the bar then grab your bar while holding the CLX and the bar at the same time. Bend down to one knee and use the other leg to stabilize. Holding both the bar and the CLX in front of you rotate your trunk and push the end of your bar toward the opposite hip. Hold briefly and return to starting position and repeat on both sides.